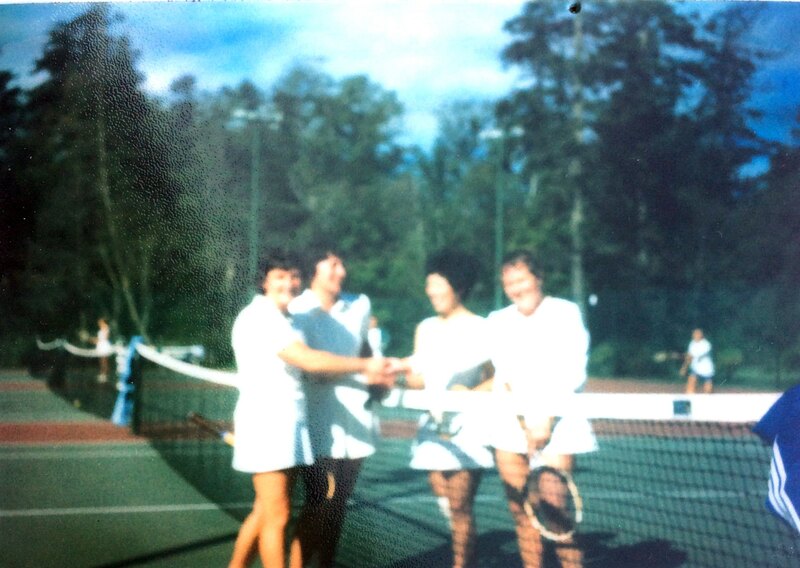 The Saanich Tennis Club was formed on August 25, 1971 by a group of approximately 30 players who had been meeting for matches at various courts in the Saanich area. It was incorporated as a non-profit society under the Societies Act on September 16, 1974. The club did not have its own home courts and it reserved block bookings on various Saanich outdoor courts, notably Lambrick Park and the BC Hydro courts on Viewmont Avenue as well as at the Cedar Hill Bubble during the winter months. Through the 1980s the club investigated the possibility of constructing its own courts but the high cost of land and a lack of funds precluded this option. It was difficult keeping the membership together with play at several different locations and a hoped for addition of outdoor courts at the Cedar Hill Recreation Center never materialized. At the 1989 Annual General Meeting the executive was directed to actively explore the possibility of acquiring courts for the club. 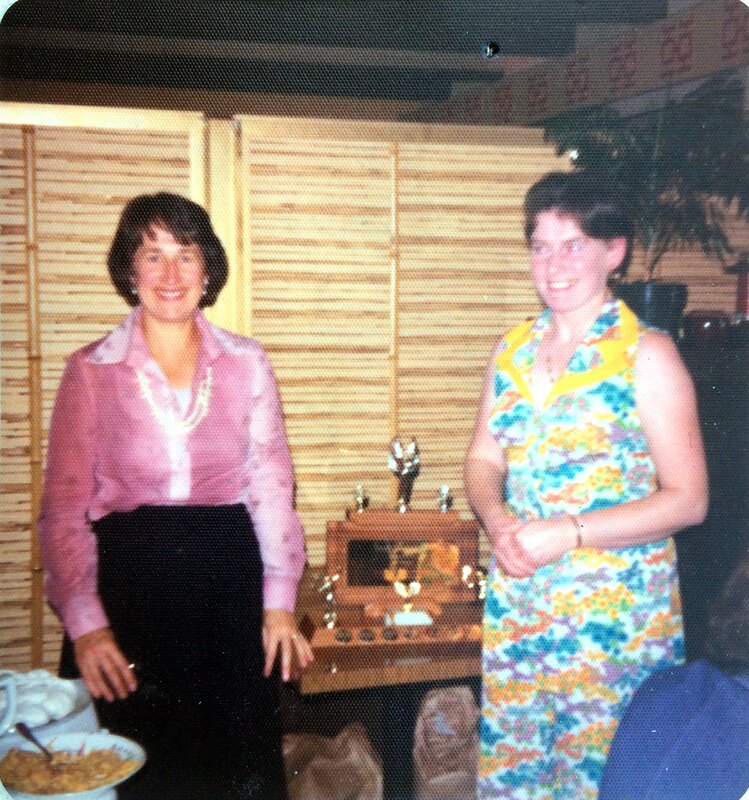 In March 1990 the club approached BC Hydro and Saanich Municipality with respect to the 2 courts on Viewmont Avenue. BC Hydro owned the land and had paid for the construction of the 2 tennis courts, then had turned the use, administration and maintenance of them over to Saanich. The clubhouse was constructed in 1993 courtesy of a grant from the BC Lotteries Branch and the donated labour of the Fairey Technical School located within Victoria High School. Also in 1993 the parking area was gated to pacify the neighbours and by 1997 the current configuration of fencing and the path from the clubhouse to the parking lot was completed. Over the years the club has actively investigated adding additional courts however the reluctance of both BC Hydro and Saanich Parks to support any expansion has precluded any forward movement. 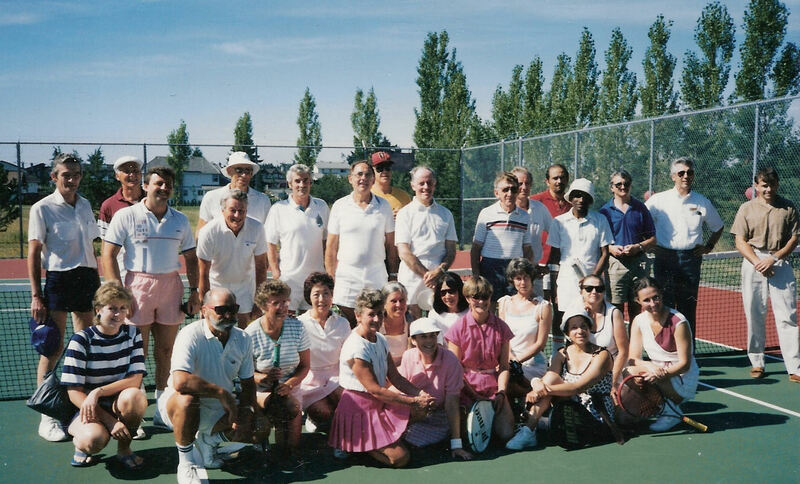 The Club celebrated its 30th Anniversary on August 22, 2004 with a day of tennis and a BBQ on its expanded deck. 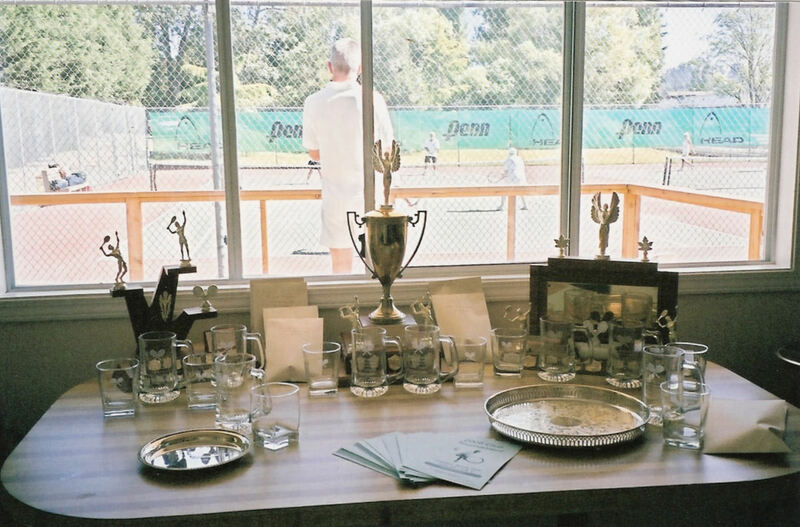 The Club celebrated its 40th Anniversary on July 26, 2014 with an exhibition tennis match and a burger lunch. 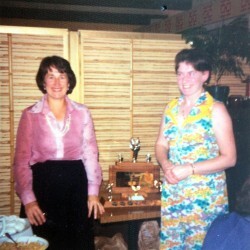 Fran McTavish and Isabel Heaman having been presented with trophies for winning the ladies doubles in the club tournament ca. 1974. The photo was taken at the club banquet which was held every year at the Chinese Village restaurant, courtesy of Jack Lee, the owner, and Sylvia Fong. 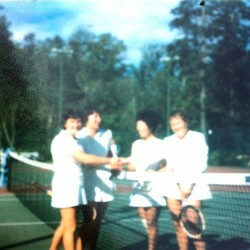 A foursome shaking hands at the net. They are Eunice Gibb, Isabel Heaman, Sylvia Fong and Evelyn Samuel (as she then was). it dates from roughly the same time.